Newark, NJ – Essex County Executive Joseph N. DiVincenzo, Jr. recognized the public service contributions and accomplishments of Lt. 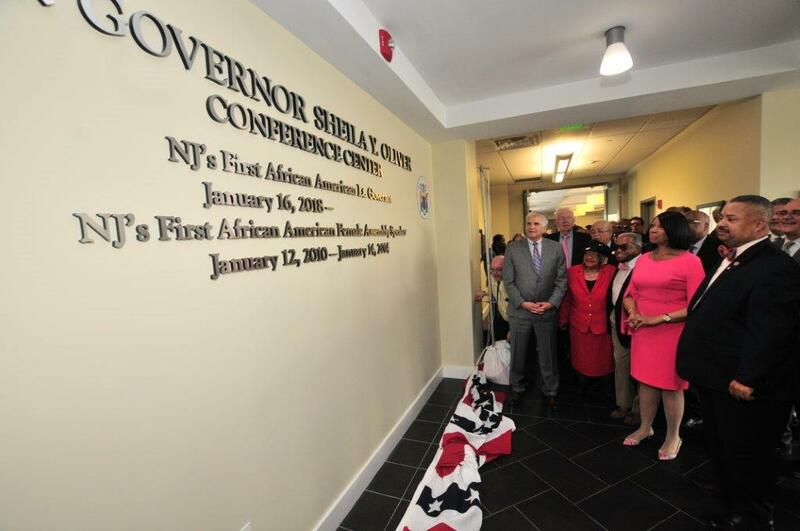 Governor Sheila Y. Oliver by rededicating the conference room on the 14th floor of the Essex County LeRoy F. Smith, Jr. Public Safety Building as the “Lt. Governor Sheila Y. Oliver Conference Center” on Tuesday, March 27th. The renaming recognizes Oliver as being the first African American Lt. Governor in New Jersey. The room previously was named for Oliver in 2013 to recognize her for being the second woman to serve as Assembly Speaker in New Jersey history. “Sheila Oliver has had a long career in public service, been a strong advocate for her constituents and a role model for other women and children, and raised awareness about a variety of social issues and injustices. She has also been a trailblazer and pioneer, including becoming the first African-American Lt. Governor of New Jersey,” DiVincenzo said. “It is important to recognize and celebrate people such as Sheila because they break barriers, inspire us and show what can be accomplished with hard work and determination,” he added. “This day is more significant to me than the day I was sworn in as Lt. Governor because I know everyone sitting in every row and in every chair. I have had participation with every person in this room,” Oliver said. “This is an overwhelming honor and I thank our County Executive. It’s great to see all these faces before me,” she added. Friends, colleagues and other elected officials offered their congratulations to the Lt. Governor. “It’s no mistake we are here today. There are not many people to whom I look up, but with her tenacity, brilliance and integrity, Sheila has been an example for me,” Congressman Donald Payne said. “I remember Sheila from when she lived across the street from our family. And now look at what has happened. We have someone before us who personifies public service and helping people,” Deputy Chief of Staff William Payne said. “I want to thank the County Executive for having the wisdom to make this dedication happen,” Newark Mayor Ras Baraka said. “Having Sheila as Lt. Governor makes us one of the most progressive states. She is a woman of substance and this is a historical event for us all,” he added. “I have known Sheila a long time, from when we both served on the Freeholder Board. Now we are celebrating her as our Lt. Governor and this is such a thrill,” Freeholder Patricia Sebold said. “It is a real honor to see the work you have accomplished through the years and knowing that there is still so much more you want to do,” Freeholder Lebby Jones said. “This is so well deserved. We are delighted to have represent Essex County on the State level,” Freeholder Robert Mercado said. “It has been wonderful to watch Sheila grow as she has moved from one level of government to the next. Along the way, she has been in touch with our most vulnerable populations and been the champion for those folks,” Essex County Democratic Committee Chairman LeRoy Jones said. “Sheila’s heart pulsates East Orange, Newark and Essex County, but it always feels for the its people. She is a lovely lady but she is strong in politics,” Calvin West said. Ms. Oliver, running as Lt. Governor, was elected with Governor Phil Murphy in November 2017. Her public service career is long and varied, and she has served on every level of government in New Jersey. Ms. Oliver was elected to the NJ General Assembly in 2004 representing the 34th Legislative District and served there until 2017. While in the Assembly, she was the first African American woman to be NJ Assembly Speaker when she served as from 2010 to 2014. Previously, Ms. Oliver was the Essex County Director of the Department of Citizen Services and Department of Economic Development, Training and Employment, the Assistant Essex County Administrator, a member of the Essex County Board of Chosen Freeholders and the President, Vice President and member of the East Orange Board of Education. She was one of the founders of the Newark Coalition for Low Income Housing, which sued the Newark Housing Authority and U.S. Department of Housing and Urban Development in federal court to block the demolition of publicly subsidized housing in Newark when there was no plan to replace units for low-income families. In addition, Oliver was the first woman in East Orange to launch a competitive campaign for mayor when she unsuccessfully ran for that office in 1997. Ms. Oliver campaigned to fill the remainder of the late Senator Frank Lautenberg’s term after his untimely death in June 2013. The only female in the special election, she used her state-wide platform to raise awareness and start a conversation about important issues affecting New Jersey residents. Ms. Oliver was born in Newark, currently resides in East Orange and graduated from Lincoln University in Pennsylvania with a Bachelor’s Degree in Sociology and from Columbia University with a Master’s Degree in Planning and Administration. In addition, several buildings and open spaces in the Essex County Government Complex have been named after prominent people who have influenced the development of Essex County. The plaza in front of the Hall of Records and a bronze statue honor Civil Rights leader Dr. Martin Luther King, Jr.; the park next to the Historic Courthouse and statue in front of the Hall of Records honor Barringer High School graduate and U.S. Supreme Court Justice William J. Brennan, Jr.; a plaza in front of the Essex County Veterans Courthouse and a statue honor Civil Rights pioneer Rosa Parks; the plaza in front of the LeRoy Smith Public Safety Building and a statue honor the late Congressman Donald M. Payne, who was the first African American Congressman in New Jersey; the plaza at the south entrance of the Veterans Courthouse and a statue honor former New Jersey Governor and Essex County Prosecutor Brendan Byrne; and the plaza in the Essex County Veterans Memorial Park and a statue honor the late Jorge Oliveira, a 10-year veteran of the Essex County Sheriff’s Office who was killed while serving his country in Afghanistan. The Veterans Courthouse and the Essex County Veterans Memorial Park are named as a tribute to the men and women who have defended our country and freedoms while serving in the U.S. Armed Forces. The Essex County LeRoy F. Smith, Jr., Public Safety Building is named for LeRoy Smith, a Newark resident who served as Deputy Director of Emergency Medical Services for the University of Medicine & Dentistry of New Jersey for 38 years before retiring in 2007. In Brennan Park is a monument recognizing the late Charles Cummings, who served as the official Newark historian and librarian with the Newark Public Library for over 40 years. The plaza in front of the Historic Courthouse is named for former Essex County Prosecutor James Lordi. The former 13th Avenue on the southern side of the Essex County Hall of Records was transformed into a tree-lined promenade when the Jurors’ parking garage was opened in 2008. It was later named “Legends Way” and features bronze plaques recognizing people who have made significant contributions to Essex County.